Career Development at SILS encompasses three areas: exploring different information careers and industries, developing career related skills to succeed in these roles, and connecting with alumni and employers. Our goal at SILS is to offer career development guidance and services so that our students can gain the relevant experience they need during their program to be successful in their post-SILS positions. Appointments for students are now made through the University Career Services Handshake platform. Please visit careers.unc.edu and access the Appointments tab. After entering your ONYEN, select 'SILS Career Appointment' to find my calendar. Questions can be addressed to SILS' Career Services Coordinator, Lori Haight. BSIS: Based on an 100% knowledge rate (35 of 35), 86% of BSIS graduates have jobs or are in graduate school. 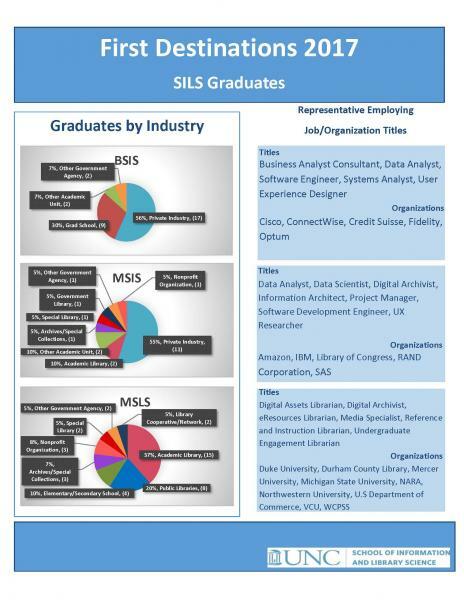 MSIS: Based on an 100% knowledge rate (21 of 21), 95% of MSIS graduates have jobs or are in graduate school. MSLS: Based on an 98% knowledge rate (44 of 45), 89% of MSLS graduates have jobs. Click here for a pdf with highlights from the report. It's amazing where a degree from SILS will take you!